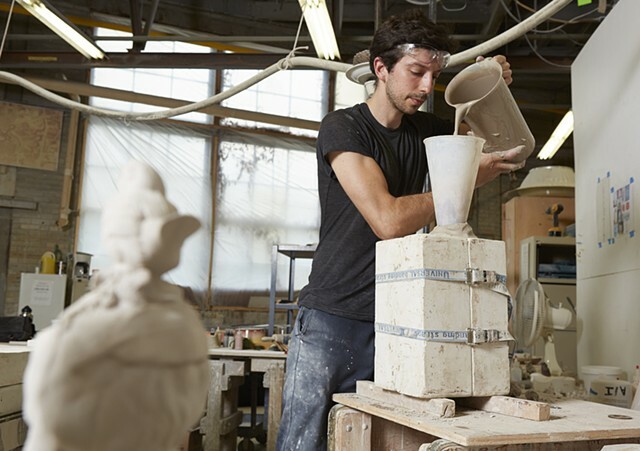 image: Slip casting vitreous China during an Arts/Industry residency at Kohler Co.
"The Success of Justin Richel's work is that it comes as a complete package, and yet in no way does he present his subjects as closed. His images are captivating from a purely aesthetic viewpoint, but also contain much to ponder in terms of content. Each piece stands strongly on its own, but forms a visual language that gives a firm nod to its art historical predecessors, but remains the artist's unique creation. Perhaps most importantly, whilst some very specific ideas can be culled from this language, Richel is careful to leave a generous depth of space for the viewer to explore and develop their own interpretations of the work, resulting in images that can be viewed again and again, always offering some fresh insight."